Restrict shipping methods using various product, cart and customer parameters. Make your shipping process both legal and cost-effective. Usually carrier companies propose several shipping methods to its customers such as land, air, sea shipments, etc. The module enables to restrict only unnecessary shipping methods of the carrier instead of blocking all of them. For example, you can restrict ground mail methods for the short-life products as it usually takes about a week to deliver them. Magento 2 admin panel is now enriched with shipping restrictions functionality. It enables you to set or cancel restrictions right from the grid for each particular case. Sometimes you need to restrict some shipping methods for legal reasons. In this case the module will become a perfect solution for your business needs. The extension lets you create a big amount of shipping rules using various limitation criteria based on customers, cart and product attributes. For example, some items are prohibited from being shipped internationally due to exporting country, importing country or transportation regulations. Default Magento functionality allows you to restrict shipping methods only for the whole catalog, but it can badly affect your business. Thanks to the module you can put restrictions only for the products that cannot be shipped. Arrange shipping destinations into areas and apply restriction rules to the whole area at once. Flexible settings allow you to include or exclude from the area different countries, states, regions, cities, zip codes, etc. For example, you can easily block delivery for the distant regions by creating the appropriate shipping area that includes such destinations. Use this module feature to set a postcode as a restriction rule base, for example you can apply the restriction to the zip code that starts from ‘123’ or ends with ‘XYZ’. Use this method to limit some certain customer’s facilities. For example, you have set your shop to automatically give Magento 2 free shipping when someone's subtotal is over $149, but if a customer uses a coupon that drops the order value below $149, free shipping wouldn’t be applied due to the discounted subtotal. Create Magento 2 shipping restrictions using customer attributes such as date of birth, customer group, gender etc. You can also create special shipping conditions for certain customers using this option. Shipping methods restrictions can be made based on any product attribute. For example, you can exclude ground mail from delivery methods in case the order contains some premium brands. The module enables you to restrict shipping methods in Magento 2 for particular customer groups, for example you can give access to Magento 2 free shipping method only to wholesale users. The module enables to choose shipping methods for a particular store view or a website. This function is very useful if you’re working worldwide and have several online shops. You can apply restrictions when a customer uses a coupon. For example, you provide your customers with Magento 2 free shipping in your store, and you have launched an advertising campaign with discount coupons. Let's say you are working with DHL carrier and want to restrict only ‘DHL ground’ shipping method. You can easily do it via module admin panel by setting rule condition as dhl::ground. It happens from time to time that the item is temporarily out of stock. In this case it makes sense to remove next day delivery shipping method for such items. You can easily do it with the help of the module. NEW | Enable customers to ship an order to multiple addresses due to the extension compatibility with Multi Address Checkout. Helps me make shipping options look and be relevant to shoppers. This is good to avoid any possible mess. Useful for shipping to regions with different legislation. I paid the installation fee and they helped me run the module in about an hour. So no issues or conflicts. We expanded outside our country, so shipping became a big deal. With this extension I haven’t missed any order date. The team support was manageable. Now I can use mass actions for several rules, no need to waste time. But most of all I like that they added purchase history to conditions now there’s another motivation for clients to buy more for free shipping. We used this module for m1 and didn't hesitate to buy it after migration to m2. We work with food products and for this reason have many shipping restrictions related to storing terms and conditions. This extension helps us a lot. I'm fully and totally satisfied with the extension! This exactly what we've been looking for as we work with fragile items which can't be delivered to particular locations. Due to detailed instructions we've managed to install the extension without any assistance. – New: Shipping Areas feature was added. 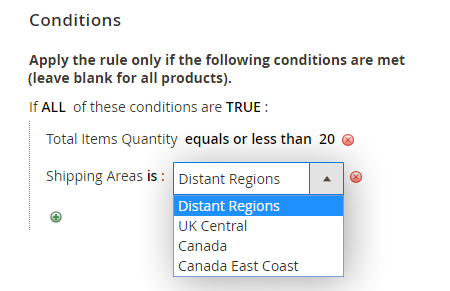 Create your custom Shipping Areas to get more geo flexibility when setting your shipping restrictions. – Improvement: new hints and tooltips added. – Improvement: UI components introduced. – Improvement: overall usability improved.